Eyes are one of the most sensitive organs of the human body. If you do not take care of them, you can invite a host of eye related problems and diseases, some which may even affect your vision permanently. Let us look at a few habits which will help you avoid various eye related problems and make sure your eyes stay healthy for a long time. You must have a diet that is rich in fruits and vegetables, especially green leafy veggies like kale, spinach and collard greens. The essential omega-3 fatty acids can be gained from eating fish like salmon, tuna and halibut. Healthy diet will also prevent obesity, which is directly linked to diabetes. This in turn contributes to eye problems like glaucoma — a disease that damages the optic nerve. Always wash your hands before touching the eyes, especially when you put or remove your contact lenses. Clean hands and fingers will prevent you from exposing your eyes to germs, and hence avoid risking infections or serious eye diseases that can lead to vision problems. You have to exercise caution when it comes to using make-up. Eyeliners, mascara and eye make-up are the perfect breeding grounds for bacteria. Dispose the make-up after every three months and buy only good quality products. You have to use protective eyewear whenever you play a sport like ice hockey, football or swimming or carry out certain home or DIY activities like gardening, sawing wood or cleaning the chimney. Safety glasses, eye guards and safety shields are designed to provide the correct protection to eyes during the activities mentioned above. The lenses of protective eye wear are made up of polycarbonate, which is 10 times stronger than other plastics. You can get protective eyewear at any eye care providers as well as some sporting goods stores. Apart from the protective eye gear, you must use sunglasses every time you step out in the sun to protect your eyes from the harmful ultraviolet rays. Buy only those glasses which can block out 99 to 100 percent of both UV-A and UV-B radiation. We spend most of the day staring at the screens of laptops, computers or smartphones for work or entertainment. This puts a strain on our eyes, which is why you must take regular breaks in between to relax them. Generally, we blink about 15 to 20 times in a minute but this drops by half when we are looking at a digital screen. By not blinking enough, the cornea can dry out and irritate your eyes. Try out the 20/20/20 rule when staring at a screen – Look 20 feet away for 20 seconds every 20 minutes. This allows you to blink naturally and give your eyes some time to relax. Regular eye checkups help in identifying vision related problems at an early stage, and in maintaining the health of the eyes. Regular eye exams can also detect diseases like glaucoma, which has no symptoms. Early detection makes it easier to cure. It is equally important to know about your family history and inform about the same to your doctor. This knowledge will help your doctor in predicting whether or not you will suffer from any hereditary eye condition. If you experience any kind of eye problems such as redness or blurry vision, visit the eye doctor immediately. These are just some basic habits which you can follow in your everyday life. Remember that if you take good care of your eyes, you can protect your vision for a long time. – Aaron Barriga is the online marketing manager for Insight Vision Center. With a knack for understanding medical procedures, and an interest in eye and vision health, Aaron loves to share what he knows and what he learns. He blogs with a mission of informing readers about the latest eye care technology and other topics related to eye care especially LASIK. He loves collecting coasters from the different bars and restaurants he visits during his travels. Some common health ailments are uncomfortable enough to cry about. Those with dry and irritated eyes deal with temporary, and in some cases, long-term pain and discomfort. Causes vary and include old age, hormonal changes, and mucus production in the tear glands. Luckily, effective treatments exist, and even better, they can be found in the kitchen. Eyes get dry due to short or long-term issues. Eyes become dry because tears evaporate quickly or due to a lack of moisture produced by glands. Causes include old age, hormones, decreased oil or water, damage to tear glands, autoimmune diseases, lupus, and other ailments. Behavior contributes to dry and irritated eyes. A decrease in blinking can irritate the eyes and may take place when watching too much television or working on the computer. When paying great attention to the screen, people ‘forget’ to blink, which results in dry and irritated eyes. Additionally, wearing contact lenses adds to dryness, irritation, and eye strain. Bacterial keratitis is linked to contact lenses; as the lens rests on the eye, free circulation and tears are obstructed, which leads to tear evaporation and dry eye syndrome. Particular health conditions and a lack of vitamin A contribute to eye problems, specifically dry and irritated eyes. In addition to prescribed medications, solutions are found in the home. Since dehydration can be the cause of dry eyes, water is a simple solution. Consuming 8 to ten glasses per day helps dry eye patients and aids in recovering from dry eye syndrome. Eyes get dry when people are sleeping. A lubricant can be applied before going to bed so eyes stay moist through the night. A washcloth dipped in water is a simple solution. Also, abstaining from washing and overly drying eyes helps avoid irritation. Take breaks from working so eyes get enough rest. As mentioned, a lack of blinking leads to dry and irritated eyes. Make an effort to blink often to help eyes stay moist. Blinking also helps spread tears to the side of the eyes. Those with dry eyes often rub, which causes inflammation as dust and microbes gain entry into the eyes. Avoid rubbing or touching around the eye area with unwashed fingers. Cucumbers, freshly cut and chilled, can be placed on the eyes, which numbs the dry sensation and provides relief. Flaxseed oil, rich in omega-3 fatty acids, helps treat dry eyes. Put flaxseed oil in fruits and drinks. Castor oil helps retain water. It’s a great remedy for dry eyes. You can place drops of castor oil directly into eyes. Mix a few drops of lavender oil with a cup of water. Dip a washcloth in the mixture and apply to affected eyes. The solution soothes eyes and makes for a readily accessible home remedy. Dip a cotton ball in rose water or cold milk and apply to closed eyes. Leave the milk or rose water on for about 10 minutes, which allows the eyes to relax as it reduces strain. One’s surroundings influences eye moisture. Use a humidifier or air cleaner to avoid dry eyes and to keep them moist. Those in particularly dry regions, such as Colorado, should use methods of countering the dryness in the air. Aloe treats dry eyes. The gel or viscous liquid inside the leaf may be applied to the eyelid. Believed to reduce the symptoms of dry eyes, aloe is effective when placed on the lids but avoid direct contact with eyes, as it may increase irritation. We are what we eat. Proper nutrition keeps eyes moist and healthy. Essential fatty acids are present in fish oil, and omega-3 and 6 acids are found in dried fruits and grains. Eat walnuts, sesame, grape seeds, almonds, and whole grains. Grapes support eye health and are known to prevent retinal diseases. Lastly, soaking a towel in warm water and placing it on the face for fifteen to twenty minutes maintains eye moisture. Common things add to irritation. It’s important to take note of what to avoid such as dry environments and air condition. If you’re prone to dry eyes, avoid dry areas and situations, such as being around smoke or using a hair dryer. Staying in air conditioned environments for a lengthy period makes eyes drier than normal. Limit computer use. If you use a computer at work, take breaks often and rest your eyes. Excessive coffee consumption intensifies dry eyes and has been linked to dry eye syndrome. Acidic foods, such as tomato products, vinegar, and tamarind, aggravate affected eyes. For some dry eyes and subsequent irritation is common, yet effective treatments are found in most households or at a local grocery store. – Melissa Holden has been involved in natural healthcare most of her life. Aiming to spread the word further that nature can cure, she writes for health and wellness sites, green/eco sites and more. 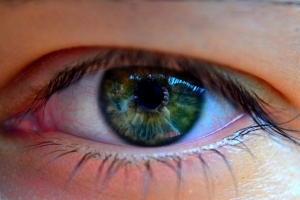 Read TheAlternativeDaily.com for additional home remedies that relieve dry and irritated eyes. Fraxel, a fractional laser treatment, can be used to gently resurface eyelids gradually and can be used in addition to filler or surgical treatments. This laser therapy is the most innovative approach to laser skin treatment by resurfacing the skin 15 to 30 percent each session. Just one treatment Fraxel can reverse up to 10 years of eye aging. Microscopic columns of treatment are administered along the desired sections of skin which stimulates collagen production, the protein responsible for tightening and structuring the skin. Results are usually seen within one to two weeks post treatment, and there is virtually no downtime because no invasive surgery was necessary. Aside from eyelid tightening, the Fraxel laser is also an effective treatment for fine lines, wrinkles, surface scarring, sun spot pigmentation and sun damage. Ultherapy is FDA approved for nonsurgical brow lifts, which is an effective way to smooth out and tighten the skin around the eyes to achieve a natural, young looking set of eyes without turning to surgery alternatives. Ulthera uses ultrasound technology to tighten skin by thermally heating deep layers of the skin, which stimulates new collagen production. With new and healthy collagen, the skin will tighten and strengthen the foundational layers of the skin, ultimately smoothing skin from the inside out. When Ultherapy lifts the brow and opens up the eyes, it reduces the excess skin that rests on the lids. This non-surgical alternative creates and maintains a more youthful appears in one 30 to 60 minute procedures that provides patients the ability to forgo invasive eyelift surgery. Another effective non-surgical eyelift treatment utilizes Restylane’s ability to create a fuller lower eyelid while filling in lines and folds. This cosmetic dermal filler’s key ingredient is hyaluronic acid, a natural sugar found in the body. Because it is naturally produced, there is no chance of an allergic reaction, which also makes it biodegradable. The body will naturally break down the filler substance within six to nine months post injection. The whole procedure takes 10 minutes and is injected into the lower eyelids in order to rejuvenate its appearance and restore volume for sunken eyes. Patients often complain about the crow’s feet that appear along their eyes from years of smiling, laughing and squinting. Similar to the effects of fillers, which tighten and smooth the skin, Botox and Dysport provide the patient with similar results. Dysport and Botox share the same active ingredient, botulinum toxin A, a neurotoxin that simply immobilizes the nerve’s messages and stops the muscle contraction from happening. The repetitive muscle contraction, whether it be squinting or laughing are what cause the lines around the outside of the eyes. Botulinum A blocks the nerves that cause unnecessary micro movements of the muscles, which stops the crow’s feet wrinkles from happening. The nerves won’t lose their ability to contract muscles; instead it will just stop the face from making micro-movements. When micro-movements are made throughout the face, they begin to form fine lines and hard to treat deep wrinkles. Results of a tighter and smoother skin around the eyes generally begin to show 24 hours to five days after injection. These wrinkles are indicators of older age, although recently younger people are taking steps towards avoiding the development of wrinkles all together by using Botox or Dysport. Having long eyelashes can give the appearance of more youthful and attractive eyes. There are hundreds of different ways to appear to have longer lashes. Fake eyelashes with messy glue, makeup tricks, curlers, diets, transplants, and over-the-counter drugs, are all inconvenient methods that could be avoided. 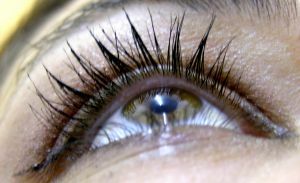 Latisse is the first and only FDA-approved prescription treatment for eyelashes. The results are thicker, longer and darker lashes with a simple treatment application. Beautiful actress and model Brooke Shields uses Latisse for longer, fuller lashes because of its effectiveness. It is not only a safe alternative to the chaos of other methods, but it is also delicate to the sensitive surrounding area. Latisse is applied to the base of the upper lashes and is clinically proven to be highly effective in almost 80 percent of patients. Patients that dab Latisse on their top lids each night before bed will start to see longer lashes after 4 weeks and full results are achieved in 16 weeks. The medication will automatically spread to the lower lashes when you blink. When non-surgical treatments do not provide the patient with the results they desire, Blepharoplasty, or eyelid surgery is an effective route to achieve cosmetic goals. The procedure is performed by making tiny incisions in the eyelid and under the eye. Any excess fat is removed, the skin is then tightened and sutures are secured. Removal of the under eye fat pad will significantly decrease any puffiness around the eye, which results in a brighter and wider eye appearance. Eyelid surgery can correct droopy upper eyelids, also known as hooded eyes, but does not remove dark circles or lift sagging eyebrows, each of which can be treated separately. A surgical eyelift is considered a minor surgery and can be performed while the patient is under local anesthesia or IV sedation. A combination of eyelid tightening, skin and fat pad removal can be performed on either the upper, lower eyelid or both. Dr. Cameron K. Rokhsar, M.D., is the leading authority in laser surgery and non-invasive techniques, Dr. Rokhsar, has extensive training and expertise in the field of skin tightening and wrinkle reduction. A graduate of Harvard and New York University, Dr. Rokhsar is a fellowship-trained dermatologist and laser surgeon and extensively published medical author and Professor of Dermatology at Albert Einstein College of Medicine. His offices are located in New York City and Garden City, Long Island. Myopia, also known as nearsightedness, is a medical condition that involves experiencing blurred vision when looking at distant objects. Myopia can be caused by an elongated axis of the eye, which means that the eye is slightly football-shaped rather than spherical, or by an excessive curvature of the outer layer of the eye called the cornea. These structural changes cause the light reflected off objects to focus in front of the retina rather than precisely on it, which translates into blurred distance vision. Due to adaptations of the eye, a nearsighted person sees close objects clearly, unless his or her myopia is very severe. Eye doctors or optometrists may apply lenses of various strengths to determine how much correction is needed to achieve vision that is close to perfect or maximum visual potential. measure the degree and severity of myopia. One diopter is represented by a lens that has the ability to bend parallel light rays to a focal point located at a distance of one meter. A two-diopter lense can bend the light to a focal point at 0.5 meters. Negative diopters are used to represent the required myopic correction, while positive diopters are used to evaluate the correction needed for farsightedness. Your doctor is able to assess the severity of your myopia based on the number of diopters required to correct the refractive error. Up to -5 diopters of correction, the nearsightedness or myopia is considered mild. Between -5 and -7 diopters represent a moderate myopia, and beyond -7 diopters is considered severe myopia. Myopia is easily corrected with prescription glasses based on the evaluation done by an eye doctor. After an eye exam, each patient receives an eyeglass or contact lense prescription that contains the number of dioptric correction required for each eye. Myopia can be treated through laser surgery, which is done to slightly alter the outer surface of the cornea in order to obtain a correct focus of light on the retina. There are no medically proven ways to prevent myopia. Working for many hours daily on the computer, a lot of reading or other types of close, highly detailed work may increase the chances of developing nearsightedness, but no definite medical confirmation through research studies has been obtained yet. People of Asian descent are more susceptible to developing myopia than people of European or African descent. Myopia appears to have a relatively strong genetic component, although environmental factors, including high levels of stress, have also been attributed to an increased susceptibility to develop nearsightedness. Pinhole glasses work by allowing the entrance of limited light bundles through pinholes made on an opaque material that replaces the traditional eyeglass lenses. By limiting and filtering the light that enters the eye, pinhole glasses enable a better light focus on the retina, which translates into improved vision when looking at distant objects. Additionally, pinhole glasses reduce the amount of light that stimulates the eye, which is useful in people with degenerative disorders of the eye, such as macular degeneration or cataracts. Medical professionals recommend pinhole glasses as a cost-effective, natural way to train your eyes and correct the myopic refractive error. 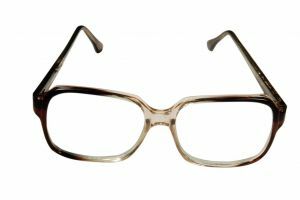 – Kelly Padmore is an optometrist with nearly two decades under her belt. She enjoys sharing her knowledge on eye health via various blogs. Click here to find out more.